Hummingbird Predators. Believe it or not! Did you ever wonder if there were hummingbird predators? Hummingbirds are tiny and extremely fast. They have remarkable flight abilities. This works both in their favor and against them. Theses birds can fly at speeds of 20 to 30 miles per hour. So good luck to any predators trying to catch them. On the other hand, insects do not usually eat birds. Hummingbirds can be the exception because they are so small and have the same rapid movement of some insects. 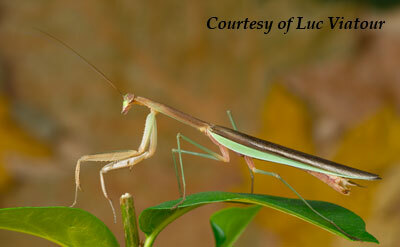 So yes, they can be mistaken as insects by some larger insects who attempt to catch them, sometimes successfully. Humans are not actually predators of hummingbirds. There are laws against capturing hummingbirds in any way shape or form. However, some activities of humans can be a threat to hummingbirds. The main problem would be diminishing habitat as we continue to build up our cities, parking lots etc. Weather is another issue for hummingbirds. Whatever the reason, our climate seems to be changing. Storms threaten the birds migration. A lack of wild flowers on account of irregular blooming patterns, fires and floods all impact the birds. Yet, it is also a great benefit to hummingbirds that many people have fallen in love with the gorgeous little gems. We hang feeders and provide water for them more and more. Thus, we are helping to prevent the loss of one of nature's most amazing birds. Humans also keep cats as pets. There is a way to stop your cat from devouring your hummingbirds. Hang your feeder high in a location where your cat can't easily climb. If you have a cat, please don't hang your feeders on a tree limb, an eve of your house or any place accessible by the cat. They watch constantly for danger and can get away from a predator they can easily see. If the feeders are in easy view of hummingbirds they will be able to spot danger before it happens with their keen eyesight. Besides their speed and great eyesight, another way that hummingbirds can defend themselves is with their tails. If a predator does catch a hummingbird from behind, its loosely attached tail feathers pull out. This gives the bird a chance to get way. By the way, these remarkable feathers grow back quickly. Female hummingbirds use spider webs in nest building. 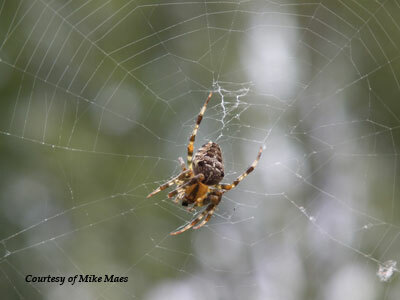 It is sad but true that they sometimes get caught in these spider webs and never get free. They become prey to the spiders in the same way as insects. 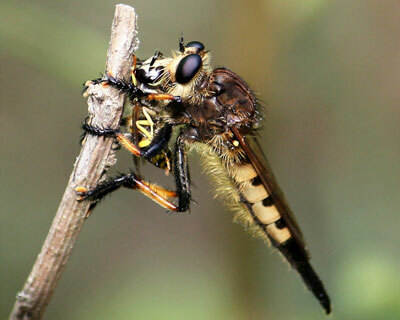 Robber Fly - a 4 inch fly that can wrap its wings around a hummingbird preventing it from flying away. Then it kills the hummingbird without much problem. Dragonfly - I was personally worried about these predators. 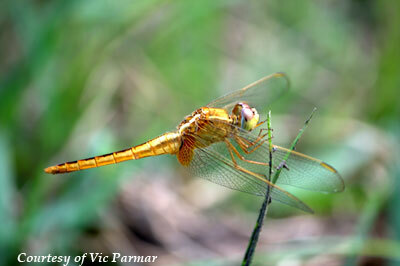 We live near a lake and have a lot of dragonflies in our backyard. I was relieved to learn that there are only a few reports of dragonflies killing hummingbirds. Actually, there isn’t any real proof that this very light insect could carry the weight of a hummingbird. Praying Mantis - specifically the large Chinese Mantis was imported from China and released in gardens as a predator on insects that eat ornamental plants but they can also be a hummingbird predator. I find this to be a concern. It seems a good idea to check into the possibilities of what other prey these insects might have their eyes on with each release. 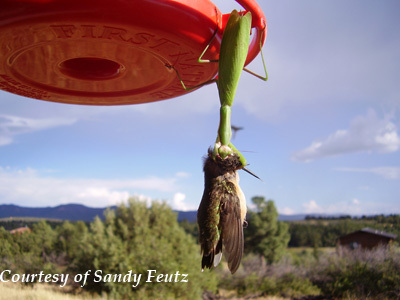 You might see a praying mantis on your hummingbird feeder ready to strike. These insects are capable of grabbing hummingbirds with their spine-lined forelegs and eating them. Please note that this is rare because hummingbirds can often speedily get away. They have even been seen aggressively defending feeders from these killers. This is not really a pun. Hummingbirds have been found in the stomach of Bullfrogs. Often times, our friends fly too high and fast to be caught by bullfrogs. You can help to prevent disaster by providing water for hummingbirds helping to keep them away from the water source of frogs. Big birds such as hawks, owls, crows, roadrunners, orioles, grackles, gulls, and herons can be hummingbird predators. Again, hummingbirds are aggressive and have been known to fend off large hawks and other birds from their territories. Some dangerous predators lie in wait for the hummingbird. Snakes and lizards hide near a bush or a house. Again, if you have garden snakes or lizards be cautious where you hang your feeders. Keep them away from areas where you know these hummingbird predators might lurk. Have you ever discovered a sick hummingbird? They are susceptible to parasites and can often live for years with them. However, there are certain parasitic diseases of the intestinal tract that can sicken the birds. These parasitic diseases include Enciphalitozoan and Microsporid and sadly hummingbirds have been known to die from them. What to do it you find a sick hummingbird! First know that there are bird rescue organizations. Contact a Bird or Animal Rehabilitation Center in your area immediately. They can help. One thing to understand is that hummingbirds have a special adaptation called Torpor. They go into this hibernation like state to conserve energy. When in Torpor, the birds might look sick. Nonetheless, go ahead and call the bird rescue just in case. Explain to them what you are seeing and they will know if anything can be done. 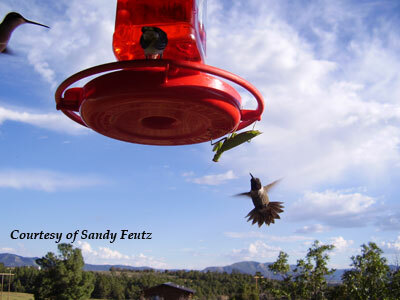 So hang hummingbirds feeders to help conserve the birds but do so responsibly. Pay attention to where you hang them to avoid predation when possible. Remember that nature is beyond our control and there will be times, unfortunately, when there is nothing we can do.